Following last week’s successful launch of six satellites, the Falcon 9 rocket’s first stage reentered Earth’s atmosphere and soft landed in the Ocean. This confirms that the Falcon 9 booster is able to reenter at hypersonic velocity, restart main engines twice, deploy landing legs and touch down at near zero velocity. At this point, SpaceX is highly confident of being able to land successfully on a floating launch pad or back at the launch site and refly the rocket with no required refurbishment. However, their next couple launches are for very high velocity geostationary satellite missions, which don’t allow enough residual propellant for landing. In the longer term, missions like that will fly on Falcon Heavy, but until then Falcon 9 will need to fly in expendable mode. 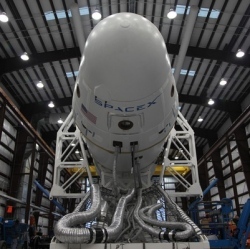 SpaceX will attempt their next water landing on flight 13 of Falcon 9, but with a low probability of success. Flights 14 and 15 will attempt to land on a solid surface with an improved probability of success.